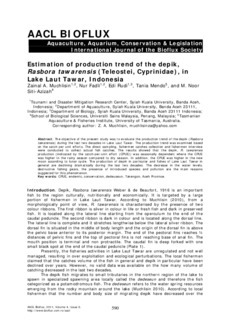 The objective of the present study was to evaluate the production trend of the depik (Rasbora tawarensis) during the last two decades in Lake Laut Tawar. The production trend was examined based on the catch per unit efforts. The direct sampling, fishermen catches collection and fishermen interview were conducted to collect actual fish catches. The results showed that the depik, R. tawarensis production (indicated by the catch-per-unit effort (CPUE)) was seasonally dependent where the CPUE was higher in the rainy season compared to dry season. In addition, the CPUE was higher in the new moon according to lunar cycle. The production of depik in particular and fishes of Lake Laut Tawar in general are declining dramatically during the last two decades. The decrease in the water levels, destructive fishing gears, the presence of introduced species and pollution are the main reasons suggested for this phenomenon.